25 years ago, the University of Michigan's Fab Five of Chris Webber, Juwan Howard, Jalen Rose, Jimmy King and Ray Jackson, widely considered the greatest high school recruiting class to land at one school, made their March Madness debut as freshman. 25 years ago, the University of Michigan’s Fab Five of Chris Webber, Juwan Howard, Jalen Rose, Jimmy King and Ray Jackson, widely considered the greatest high school recruiting class to land at one school, made their March Madness debut as freshman. They assumed their place as one of the most culturally significant squads that not only dominated on the basketball court, but they also resonated with a stylistic African-American flair and cultural imprint that places them on the continuum, along with the likes of Louisville’s Doctors of Dunk, Houston’s Phi Slamma Jamma, Georgetown’s Hoya Paranoia and the UNLV Runnin’ Rebels, that merged college basketball with the emerging Hip Hop aesthetic. My man Rod Strickland and I recently chopped it up with Chris Webber on our Strictly Speaking podcast and got some of his reflections from his Fab Five experience. “Michigan was only 30 minutes from my doorstep. I grew up in Detroit and being that I was the oldest of five kids, I thought I was going to stay close to home. Michigan State was about 90 minutes away, so with both I could get home and get my mom’s cooking and that was important to me. But the biggest thing was Juwan [Howard], who I’d become close with at the Nike camp, and Jalen [Rose] were thinking about Michigan. Juwan basically recruited everybody because he was the first to sign with Michigan. When he signed…from that point he recruited all of us…I knew wherever I went with him he was going to play hard, he was going to hold me down. He wasn’t about trying to show off or be the man. I knew he was going to be a great teammate. He was like, ‘Look man, Michigan is sorry and not good. We’re gonna get a chance to play.’ He really opened my eyes up to it because Michigan State was really in the lead then with me. Then Duke was in the lead after I visited with Grant Hill, who I’d known since high school and he was working me hard. When I went to Michigan, it was one of the best decisions of my life, finding some brothers there that I could could play with. When I look back at my time at Michigan and the impact that we had, it was crazy. Everybody was on the same page, man. It was no ‘I’, it was just ‘Us’. That’s what I loved about that time. And it was sincere, we weren’t frontin’. People can ask today about we knew who we were and we were stars and all that, but we didn’t know what was going on. We were just ready to run through a wall, we just had heart, we were just being honest. Because if you try to plan it, it can’t happen the way that it did. Through the good and the bad times, I wouldn’t change not one thing. Not the timeout, nothing. It was a blessing and I’m glad I listened to Juwan on that. UNLV, they were my favorite team of all-time. I wanted to be like a Larry Johnson, a Moses Scurry, a George Ackles. We took our shorts from Illinois, that was another of my favorite teams. They went to the Final Four in ’89 with Stephen Bardo, Kendall Gill, Marcus Liberty and those guys. They could all switch and they were athletic and dunking! 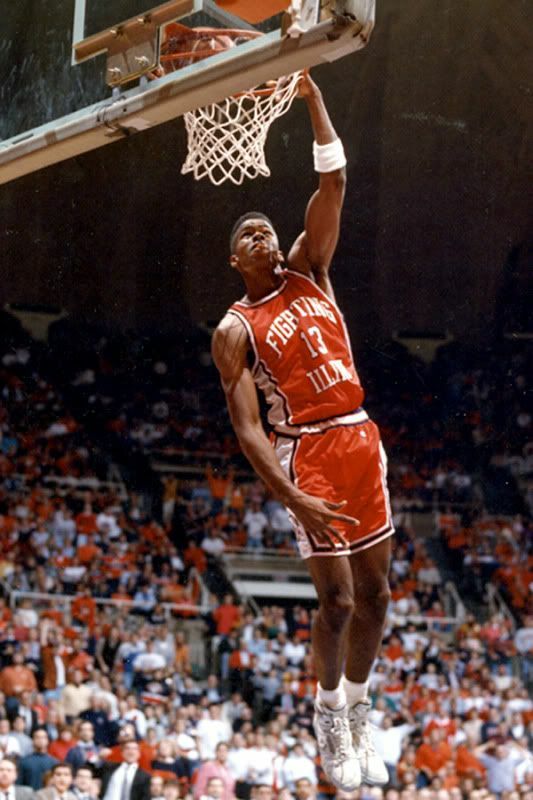 They had those fresh Illini shorts on. We wanted to be like those guys and I’m glad we took it to another level. It was crazy hard [making the decision to leave Michigan as a sophomore]. If it was up to me, I would have come back. I definitely went [to the NBA] to take care of my family. But back then, going early wasn’t necessarily the thing. And that’s what I mean about the brotherhood. I wanted to come back as a junior for a championship and they were like, you know, they wanted me to go for a good life.